You Should Enable Content Only If You Trust The Contents Of The File. We can select the command Trust Center Settings in order make the settings that we want in the Trust Center Settings window. If we want to know more about Active Content we select the command Learn More About Active Content and the Help window will appear providing us with more information about Active Content. Enable All Content: Always enable this document’s active content (make this a Trusted Document). Advanced Options: Select which active content should be enabled. This content will be enabled for this session only. If we select the Enable All Content, the document will become a trusted document. If we select the Advanced Options command, the Microsoft Office Security Options dialog box appears as shown in the image below. Under the Security Alert – Links area, we are informed that Automatic update of links have been disabled. If we choose to enable them our computer might no longer be secure. If we select Help Protect Me From Unknown Content (Recommended) the workbook will be activated ready for editing but with some limitations in its function. If we select Enable Content For This Session, we can work on the workbook only on the currently session. If we open it again later on, we will have to follow the same procedure as before. 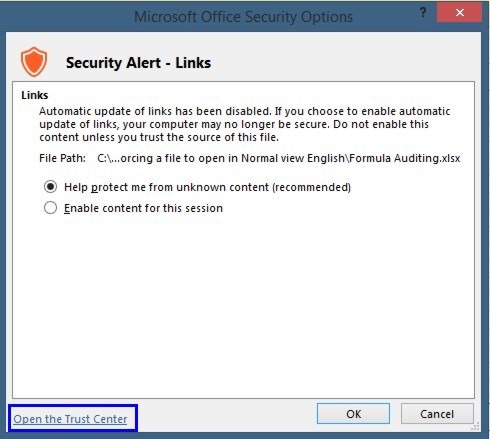 At the bottom left corner of the Microsoft Office Security Options dialog box we are provided with the Open The Trust Center command as we can see in the image above. Once selected the Trust Center window appears with the Message Bar category selected at the left of the window. Under the Message Bar Settings For All Office Applications area, we can adjust if we want the Message Bar to be or not displayed for active content. We can always select from the Trust Center window the category Protected View from the left of the window to do the adjustments about the Protected View function. As we can see in the image below we have several options about Protected View. We can activate or deactivate commands depending on what we want to do. The Security Warning stands for all Office 2013 applications. Below you can check out the video describing Security Warning in Excel 2013. Posted on September 28, 2013, in Microsoft Office 2013 English, Office 2013 English and tagged Active Content Might Contain Viruses And Other Security Hazards, Automatic Updates Of Links Has Been Disabled, Enable Content, Microsoft Office 2013, Microsoft Office Security Options, Office Smart, Security Alert – Links, Security Warning, Smart Office, Trust Center Settings, Workbook Links. Bookmark the permalink. Comments Off on Security Warning in Office 2013.